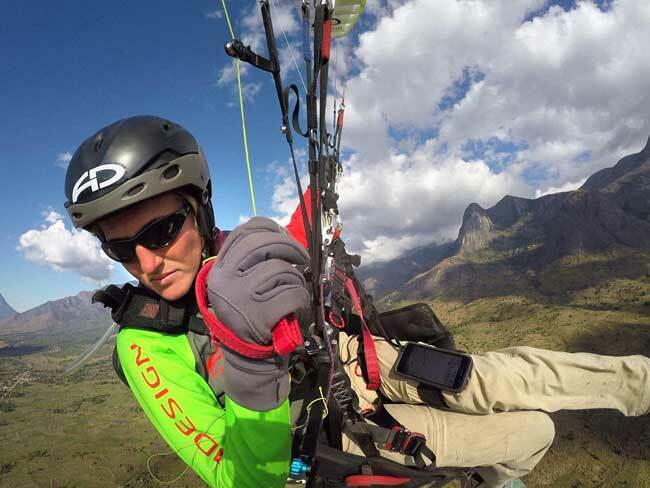 A paraglider pilot travels to rural Malawi and discovers the impact that her solar powered gear can have on the dreams of students she meets there. After checking every buckle twice, I closed my eyes, took a deep breath, and ran off the mountain. 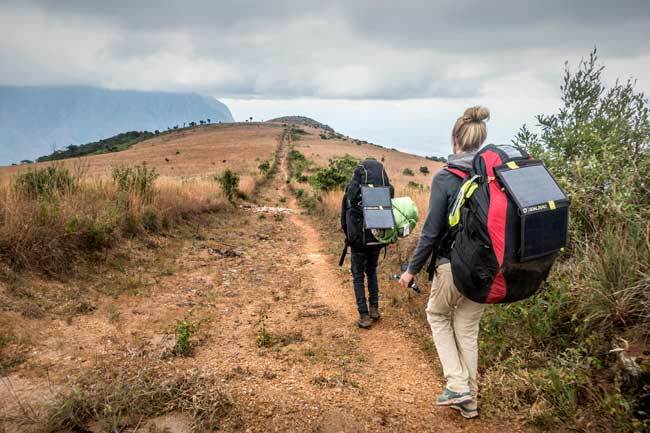 My expedition began at the Dedza Escarpment, a mountain range just SouthEast of Lilongwe, Malawi’s capital city. I wanted to be the first person to fly a paraglider from the summit of Mount Mulanje, the highest peak in the country. This was my first time leaving North America and I had only recently learned to fly. What was I thinking? While preparing to land, I was suddenly overcome with a sense of terror. Below me, a large group was quickly forming, comprised of hundreds of people, shouting and running from all directions, headed straight for the exact same field that I was about to land. As their shouting grew in intensity, I realized that I was too low to the ground to change my trajectory and was forced to land right in the middle of the riot! White puffy clouds, lush green landscape, and Lake Malawi off in the distance. Malawi is a spectacular place to fly for newb’s like me or the pro’s flying circles around me! To my delight, the mob was comprised almost exclusively of school children. Most of them wielding nothing more than a pencil and notebook, having likely just left the schoolyard. 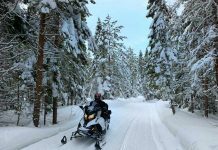 And it was while packing up my gear that I first met Redson, the 12-year old boy with near-perfect English, who had invited me to have dinner with his family that same evening. Chickens and goats scurried as I made my way down the stone path and towards the traditional home of handmade bricks. I peered inside to find a large, dark room full of harvested corn left to dry. Though it seemed unoccupied, the smell of cooked peas escaped a covered bowl in the center of the room, offering a preview of the dinner that I was about to enjoy. In the background, I could hear Redson’s mom calling him and his brothers to come eat. And as we gathered to feast, the sun disappeared behind the horizon, eventually shrouding us in darkness. After dinner, Redson was excited to show me the bedroom that he shared with his younger brother. The room was small and unadorned, except for the large bug net that hung from the ceiling covering the thin mat where they slept every night. Just then, Redson lit a small candle and proudly showed me the corner where he kept his books and studied for school. The candle barely provided enough light for me to see his face, yet he was reading aloud from the dark pages, completely unfazed. Imagine a time when having a candle was considered a luxury. Many of us can’t, but for Redson, this paraffin wax and string are the difference between making the grade, or not. Because most children growing up in rural Malawi will stop attending school around first or second grade, Redson’s attempt to pass his grade eight exams and go on to be one of 1% that make it into high school requires an incredible level of discipline and focus. I recall myself as a child, my parents constantly having to force me to do my homework, in an environment where we had light in every room. I imagined how difficult it would have been for me to do well in school, had I nothing but a candle to study by. Redson was in the eighth grade and I learned that he was preparing to write his final exams in just a few weeks. These exams would determine whether or not he got into High School the following year, a big deal since most kids in Malawi don’t make it past the third grade. You see, when the kids here get home from school, they have an obligation to help with the household chores like feeding the animals, fetching water, or working in the fields. 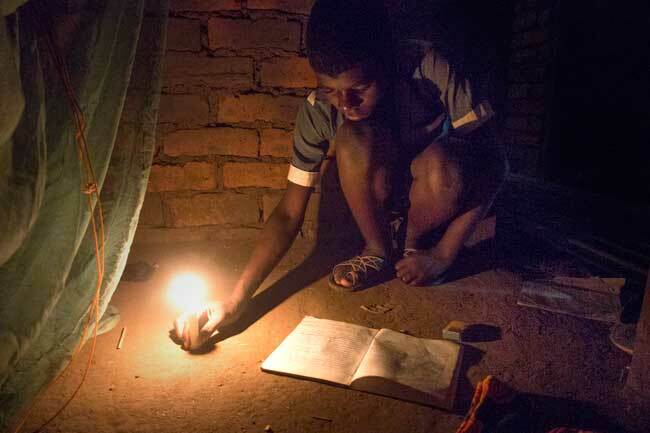 And because most of their homes are “off grid”, once the equatorial sun has set, the kids that are trying to do well in school struggle because they don’t have the light to study at home. 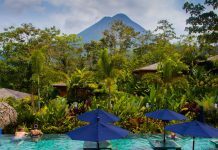 As an adventure filmmaker, I depend on solar energy every single day and choose Goal Zero products for both build quality and overall simplicity. These same qualities fit right in to the naturally rugged life style you will find in rural Malawi and the limited scope of technology the villagers can be expected to integrate into their traditional lifestyles. I had come here with the purpose of documenting hiking and paragliding in Malawi. My kit included solar panels and a battery to recharge my cameras and a variety of lights. But it was in that moment, as Redson’s candle burnt dimly, that I was overcome by a greater sense of purpose. After first obtaining the blessing of Redson’s mother, I installed a light in his bedroom and a second one in the living area of their home. The lights were powered by a small battery, provided that used solar energy and would give them an additional six hours of light per day. I never could have imagined the impact this resource could have on a family until I stepped outside and witnessed the magical light bursting through the bricks and the thatched roof. Now Redson had the tools he needed to study at any time of the day or night and their family could see each other’s faces while eating dinner for the very first time. I was so motivated by the power of sharing this energy that I had always taken for granted, that I decided I wanted to help other families just like Redson’s. So, I contacted Goal Zero and obtained more lights. 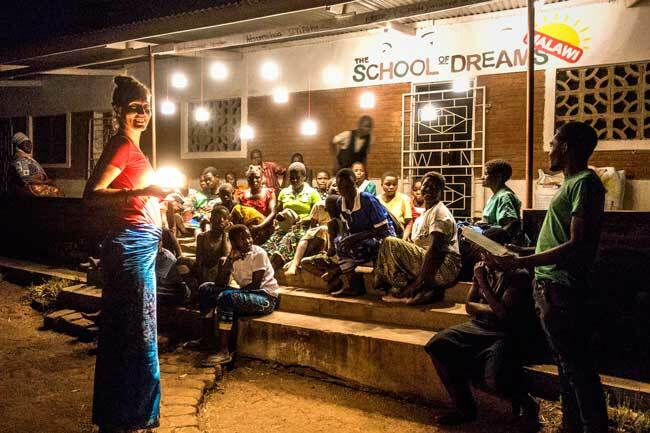 While the goal of the Dream Lights project is to help students perform better in school, the benefits of a well-lit home are extended to the entire family. 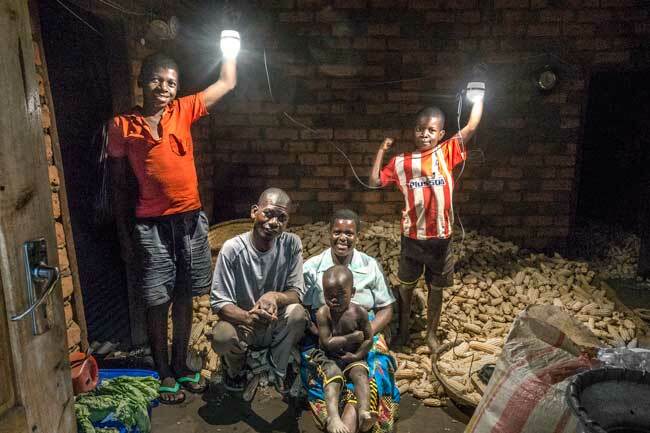 Redson’s father, mother and infant brother are equally stoked on their new ability to bring the power of the sun into their homes, long after it has set! Despite not having fully achieved my original dream of flying from the summit of Mount Mulanje, I was leaving Malawi with a much greater sense of accomplishment. Far more rewarding than any record or first I could have obtained. I had found a much deeper sense of purpose inside of enabling the youth to achieve their own personal summits. And it was during my final flight, just before departing this beautiful country, that the friendly mob of children swarmed me once more. Amongst the familiar faces was Redson, who had come to tell me that he had passed his final exams and would be going on to High School next year! I look forward to going back, so I can check in with all the families that received lights, and bring more lights so I can keep helping kids all over Malawi achieve their dreams. 15 families from the local village have been invited for a special evening at The School of Dreams. Each of them will receive one of these new “Crush Lights” which combine all Solar Panel, Battery and Light into one tight and collapsable package. We are very excited. The School of Dreams is a volunteer-run paragliding training program in Malawi, Africa which measures its success by the growing attendance of schools in the areas it operates. Whenever a pilot lands, they are mobbed by hoards of excited children from the surrounding villages. The pilot then sparks a conversation with the students about the importance of school and encourages them to go. It’s working. But there’s a catch. Even with increased attendance, students grades suffer for the simple reason that they aren’t able to study at home. Once they’ve returned from school, most youth have farm work or household chores, like fetching water, to tend to and, because Malawi is so close to the equator, the sun has often set by the time they are done. The “Dream Lights” initiative honors the efforts of hard working students by offering them the gift of Solar Powered Light, enabling them to complete their homework and allowing them to excel in school to their maximum potential. Together with Goal Zero, the School of Dreams launched its pilot project in July of 2018, installing kits in ten homes, providing an average of six hours of light per day to a total of 26 students. Their progress is being tracked and, if the results are positive, the organization will propose that another 100 kits be set up so that every student in village may benefit from this sustainable energy.